“International Students Evening” held at Daffodil International University on 19th July 2012 at DIU auditorium. Professor Dr. M. Lutfar Rahman, Vice Chancellor of Daffodil International University was present as Chief Guest where Mrs. Pearl Liu, Deputy Dean, Shenyang Aerospace University, China, Dr. Aminul Islam, Emeritus Professor, DIU were present in the occasion as Special Guest. Professor Dr. S. M. Mahbubul-Haque Majumder, Dean, FSIT, Professor Rafiqul Islam, Dean, FBE were present also. Dr. Md. Fokhray Hossain, Registrar, DIU presided over the program. 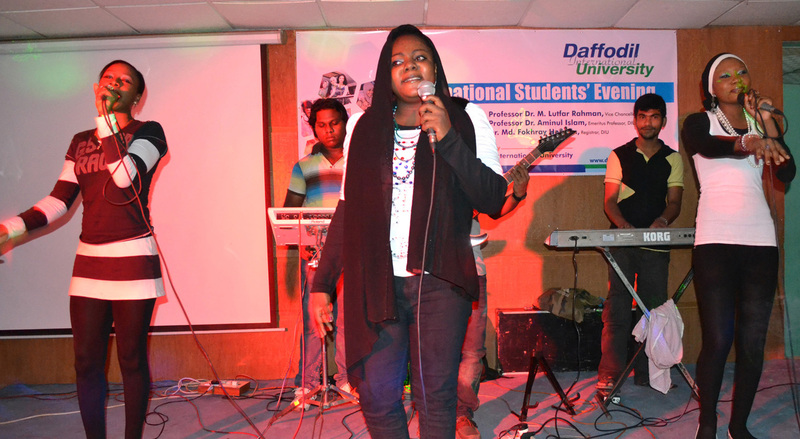 Students of Somalia, Nigeria, Turkey and Bangladeshi of Daffodil International University were shown their performance on their respective cultural aspects.